What Pearls Are Used To Create A Beautiful Colored Pearl Necklace? As a young girl, we remember the only color pearls we ever saw were white ones. However, these days there is a much wider selection of different color pearls to choose from so buying a colored pearl necklace has become a lot more interesting. There are endless possibilities to style such a pearl necklace, but first, let us show you how many colored pearls can create one! Continue reading and be part of a colorful pearl journey! Pearls do offer an amazing selection of different colors to choose from. Finding something that suits your own particular tastes should be pretty easy, if you consider our splendid pearl necklace designs. You could, of course, go traditional and stick with white. But why not be a little more daring and individual and choose colored pearl necklaces that are a mix of different colors. In the end, all you have to do is to just think about your favorite color, your wardrobe choices and there you have it! So What Colored Pearl Necklaces Can You Choose From? Well, of course, you can go for white, but there are also black, gold, rose, lavender, cream and even blue ones to select from. Below we will explain a little more about the different color pearls you can get and include in your next colored or multicolor pearl necklace. This has been the most favored pearl for hundreds of years now. Not only is it extremely versatile but, will add a touch of pure elegance to any outfit. The most common varieties of white pearls you can get these days are Akoya, South Sea, and Freshwater. Each of these comes in a variety of different sizes from 1 mm up to 20 mm. Although classed as white they actually come in a variety of different overtones, from rose to cream or ivory or silver. The last one is the one that is closest to be really white. As you may expect, white pearl necklaces are a timeless and classy choice for every woman. IEqually ideal for day and night events, the white colored pearl necklace will never fail to make you look perfect! There is no doubt that this is the go-to color for a flawless and elegant appearance, but a pearl colored necklace can spark interest too. These days black pearls, which you often see being used in multi colored pearl necklaces have now become very popular. But as the natural ones are so rare they do come with a hefty price tag. But nowadays, pearl farmers are able to use processes that allow them to change the color of a white pearl to black. The only truly natural black pearls now available come from French Polynesia and Guyamas, Mexico. The first ones from French Polynesia are known as Tahitian pearls, whilst those from Guyamas are known as Sea of Cortez pearls. There are also black Akoya and freshwater pearls available. But these don’t form naturally in the oyster, they have to be treated with a dye to turn them a darker color. But mixing them with white ones will help to create a unique and beautiful colored pearl necklace. These types of pearls range in size from 8 mm to 16 mm or larger. They also come in a variety of different shades from Peacock, which is a green, gold and rose mix to just green or green-blue. They also come in shades of rose, silver, aquamarine, and copper. So these really would make an amazing addition to any colored pearl jewelry. In our opinion, a black colored pearl necklace is the most extravagant and mysterious form of elegance. They will always add a refined note to any formal outfit. Perfect for ceremonies, business meetings or any kind of special event, black pearls are as exquisite as you are! These types of pearls are frequently used in the creation of a gold colored pearl necklace. But be aware that these are also among the largest and rarest of all cultured pearls today. They range in color from pale champagne to more intense hues, similar to the color of 24k gold. These come from the tropical atolls and lagoons close to the Philippine Islands and Australia. These like the black pearls vary in size from 9 mm through to 16 mm and sometimes even larger. The most common color of these types of pearls is of course gold, but sometimes they can have champagne, silver, rose or green-bronze overtones. For the woman who is not afraid to expose her tastes, a golden pearl necklace will perfectly complete a memorable look. Golden pearls are the ultimate form of sophistication: sumptuous, luxurious and extremely luminous! Accessorize it with a lavish golden pearl bracelet and you are ready to conquer the world! These particular pearls used in the making of a beautiful colored pearl choker necklace or pink colored pearl necklace are cultured in Freshwater mussels in China. Everyone, of these freshwater mussels, can be nucleated up to 25 times on both sides of the shell. As a result, it provides the pearl farmers in China with an amazing selection of beautiful pearls to be used in creating an amazing colored pearl necklace. These pearls are much smaller in size compared to other pearls and can range from 4 mm to 12 mm. But generally, you will find that most measure between 6 mm and 9.5 mm. Due to their delicate color, they create a wonderful gift for teenagers or petite woman who love subtle but elegant pieces of jewelry. Although they are called pink or peach pearls they have wonderful overtones ranging from green, and gold, to aquamarine or rose. As for their actual color, these can vary from pale peach to apricot or pale baby pink. Some will have a much dark pink hue to them and others will seem to look silvery pink or mauve. We recommend wearing a pink colored pearl necklace with pastel outfits. For example, a delicate dress with a floral print, a white turtleneck blouse or a beige/ light green blazer are excellent choices. You can complete your attire with a pair of pink pearl earrings and a nail polish in a similar color. As with the pink and peach pearls these ones are grown in freshwater mussels, again in China. Again the mussels can be nucleated a total of 25 times on each side of the shell. The most common overtones you will find that these types of pearls come with and which often get included into colored pearl necklaces are green or aquamarine, as well as much warmer ones such as rose and gold. The latter often get used in making a rose colored pearl necklace. Also, these pearls tend to be on the smaller size ranging from 4 mm to 12 mm, but the pearl farmers are now able to create much larger ones measuring between 13 mm and 16 mm. A lavender colored pearl necklace could be worn with a white blazer or a black suit or dress that needs a subtle and sophisticated touch of color! These are the rarest and most unique of all pearls that can be used in the creating of a beautiful colored pearl necklace. As you would expect, these are also the most expensive of all pearls. They come in wide array of colors from sky blue through to dark midnight blue and also have an amazing selection of overtones. These come in a wide variety of different sizes from the 7.5 mm up to 16 mm or bigger. It all depends on which type of mussel or oyster the pearls were cultured in. The smaller variety, are Akoya pearls, whilst the larger ones are Tahitian pearls. These authentic blue pearls go extremely well with a tailored suit, white classic shirts, and an elegant hairstyle! So as you can see from above you have a great selection of different pearls to choose from. The wide variety allows the creation of a really beautiful and unique colored pearl necklace. 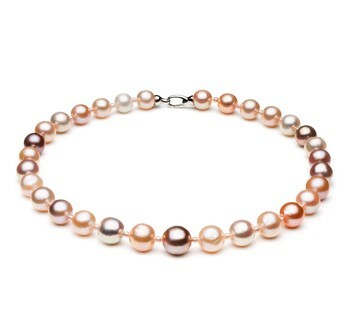 Here at Pearlsonly.com, we have an amazing array of colored pearl necklaces to choose. As a result, we believe finding one that suits your taste and budget won’t prove a problem at all. On the contrary, set up your budget, pick your favorite color and then decide which colored pearl necklace will adorn your neck soon!